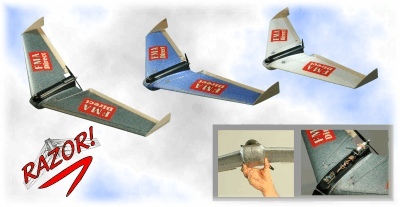 In the year 2000, I taught myself to fly R/C airplanes with a new flying wing design called a Zagi. You can find out more about these nimble aerobatic electric R/C planes by visiting the Trick RC website. I had started building a gas-powered R/C trainer many years previously and gave up part way through because I realized how hard it was to find a place to fly the plane, and it usually meant joining a club and traveling at least 45 minutes to get to the field. I also knew that my 40+ hours of work would be undone after just a few minutes into my first flight, if all went according to plan. Then I discovered an electric plane called a Zagi that looks like a delta wing that was not too expensive and only takes about 6 hours of work before you can get it into the air. It's also very crashworthy. The Zagi isn't the easiest plane to learn to fly, but you won't get bored with it after you've managed to keep it from crashing. Best of all, it can be flown in many more places since it doesn't make much noise and does not require a lot of space. Any soccer or football field is a potential flying field as long as there are not many obstacles near by. I would advise anyone thinking of learning to fly R/C airplanes to download a free simulator so that you can master one of the most challenging aspects of R/C flying and that is to learn instinctively to reverse the controls as the plane is coming toward you. After a few hours on the simulator, you'll be able to fly your plane without crashing it nearly as frequently. FMS download page. It takes a little to get the software up and running since it defaults to the German language, but the graphics and controls are very realistic. You can change the software over to English after you install it by selecting English under the menu item 'Sprache'. A joystick is definitely recommended but you can control it from the keyboard too. In fact, some of the controls are only available on the keyboard. Ron's software page This software program, FlyRC, allows you to run a DOS compatible simulator that has a few Zagis as part of its regular aircraft database. I found the models to seem to be over-powered so it's not as realistic as flying the real thing, but it will definitely get you to understand how to reverse the controls when the plane is flying toward you which is probably the most critical skill to learn. The Zagi 400X was the replacement for the Zagi 400 and with its 1700 mah battery, you could fly it for at least 10 minutes before needing to land it and recharge the battery. The original 400 had the advantage of a much lighter battery which has 500 mah of capacity. Flights were shorter, but the lighter weight does make it easier to fly. I have a 400X with both the regular 1700 mah heavy battery and the lighter 500 mah battery and I find that I can fly much more easily with the lighter battery, although my flights are much shorter. The most important factor in learning to fly the Zagi is to make sure it is properly trimmed. This means that it will not try to climb or descend on its own nor turn right or left. The easiest way to insure this is to find someone with RC flying skills, preferably with a Zagi, and let them fly it and trim it for you first. Then, when you take to the sky, you won't be focusing 100% of your concentration trying to keep it from crashing. An improperly trimmed Zagi is a handful and will take most of the joy out of flying it. Yahoo Discussions Group page on the Zagi is a great place to read through the archives and post questions to many other Zagi enthusiasts. E-Zone is a site dedicated to electric flying aircraft of all kinds with lots of information and discussion topics. Zagi Tazz (introduced in 2005): new battery tray which was much wider, with a flatter hatch; structural changes with leading edge carbon rods, plywood stiffener behind battery tray, brushless motor and ESC. Good review can be found here. Zagi XS (introduced 2006): similar to Tazz except with original 400 motor. Lower cost, targeted at beginners. Zagi HP: Current production (HP = hard point) new black plastic tray and hatch design with thicker area for a face mounting arrangement (as opposed to ty-wrap cradle) for brushless in-runner motors, plastic fairings for servo arms. Zaggi Zijji Current production (introduced 2007): new white tray with separate aluminum motor mount. Motor uses 6061 aluminum water-jet cut for face mount of either in-runner or out-runner brushless motors (although only the in-runner version is available for ordering on the website). The center section of the plane is thick which gives it a better durability in the case of a crash and a place to hold on to it while launching. The reinforcing tapes are included, making the fiberglass tape unnecessary. The elevon hinge tape uses a much better adhesive and is made of Lexan. The cavities for the servos are molded into the wing and the z-bends are pre-formed on the pushrods. The kit may may be purchased with the FMS servos and receiver, so in my case, it was more economical than buying them all separately since I already had the transmitter.. It seems to be a bit more stable in the air and less touchy, albeit a bit slower. It still can do rolls and loops. The battery is confined to a cavity inside the foam and does not depart the airframe in a crash. Only available in Blue, White, or Gray (unless you cover or paint it) and that makes it a little hard to tell top from bottom when flying it. The battery provides shorter duration flight than the Zagi battery packs. Fortunately it will work with either 400 or 400X Zagi battery packs if you change the Deans connectors. If I were to do it again would I purchase the Zagi first? I'd have to say, 'Yes'. The materials to repair or even rebuild it are readily available and I can't say for sure that the FMS Razor is any easier to fly. It just seems that way since I had already learned how not to crash with the Zagi. The weight of the FMA is significantly more than the Zagi, and that means it's not nearly as nimble. Shortly after writing this, FMA stopped selling the Razor, so it looks like the Zagi is the best choice for a flying wing.